The Alamosa Live Music Association and La Puente invite the community to sing along to traditional holiday carols and other holiday songs, at 6:00 p.m. December 23, at Milagros Coffee House, Alamosa. 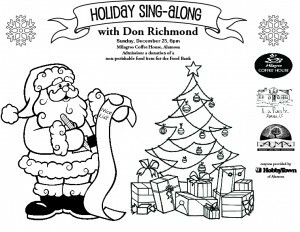 Local musician Don Richmond will lead the Sing-Along. A community tradition, the Sing-Along is a wonderful opportunity for locals to come out, bring their families and enjoy an interactive holiday event. 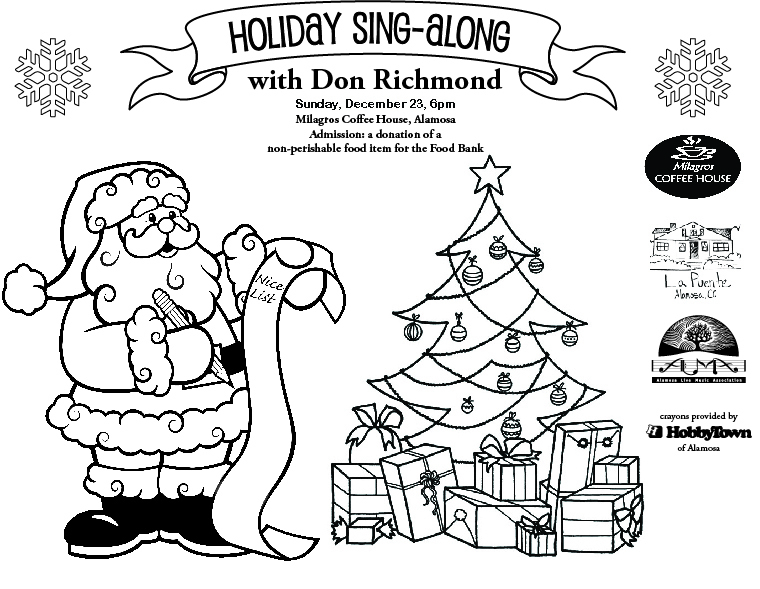 Attendees can request their favorite holiday tunes and song books will be provided to facilitate singing. A willingness to participate and have a good time is the only admission requirement for the event, but it is suggested that attendees offer a donation of a non-perishable food for the Food Bank. Join us at a Jam Session for experienced, local musicians. Thursday, December 6, 7-10 pm. 625 Main St., Alamosa, CO 81101. This is a potluck, so folks are invited to bring a snack item to share. Questions? Contact Nancy at 719-937-1255. 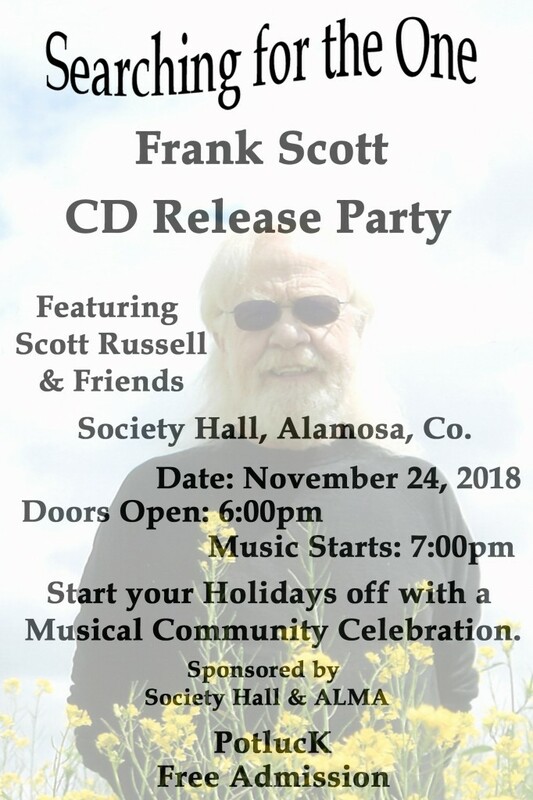 ALMA and Society Hall present Frank Scott, a CD Release Party, on Saturday, November 24. 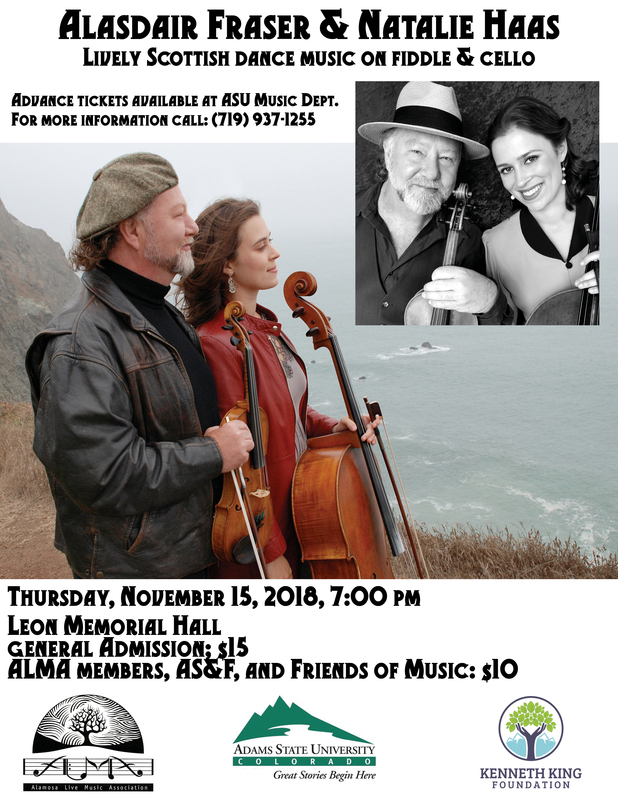 Frank and several local artists will be performing the songs from his new CD, “Searching for the One,” at Society Hall, 400 Ross Ave., Alamosa, CO 81101. Join us for this free concert and community potluck at 6:00 PM, with music starting at 7:00 PM. Frank Scott was born and raised in New York City. Upon graduation from college, Frank hit the road for a few years, eventually landing in Alamosa in 1973. Frank still resides in Alamosa, where he raised his family. Frank helped form the Lucky La Rue Band in the early 90s with his friend and fellow educator, Fred Gonzales. The band had a large local following for over a dozen years and produced two well-received CDs. Heavily influenced by his Scottish background, Frank formed a Celtic group called Celtic Cross. 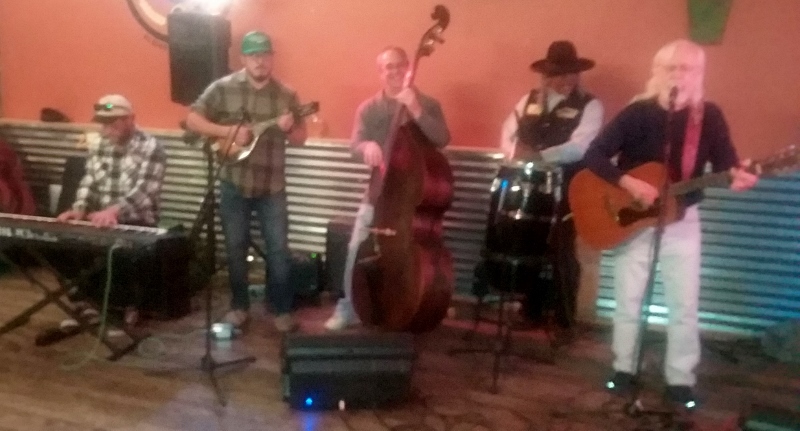 This group morphed into the 40 Below Band, which can still play a night’s worth of Celtic music, as well as some Jazz, Rock, Country and originals.